Thank you for your interest in volunteering at the Winston-Salem Open! We owe the success of our event each year to people like you who graciously give of your time and talents. To learn more about our various areas of service, we encourage to read over the information below. Once you have reviewed all the information and made your decision, please complete this form, if you are a new volunteer, or are a returning volunteer who would like to would like to serve in a different area. If you want to be as close to the action as though you were the tennis ball itself, then please visit our ball persons page for all the details on how to secure one of these coveted spots! Would you like the welcome all the Winston-Salem Open players, coaches, media members and VIPs to the tournament? If so, then you want to be a volunteer in our credential area! You will be responsible for greeting all our guests and processing his or her credential request. In order to be considered for this department, you must have basic computer and printing skills. Are you the one everyone turns to for information or advice? Then we need your special skills in our guest services area. You will be one of the most important faces all our patrons see! You will be answering questions about the tournament, directions, scheduling, and helping fans and friends with lost and found. You must be at least 18 years old. Previous attendance at the Winston-Salem Open and/or working knowledge of the tournament and the surrounding areas is preferred. 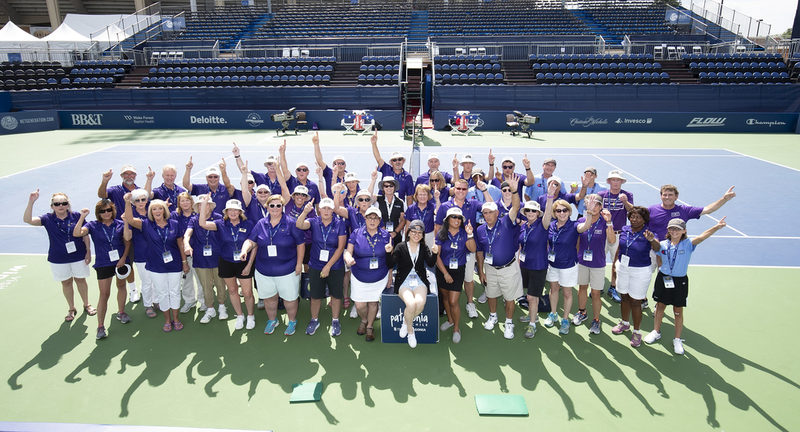 If you’re dedicated to ensuring all the Winston-Salem Open players and guests have the most fantastic experience possible in the Twin Cities, then we would love to have you on our hotel hospitality committee. You will assist with all events at our spectacular host hotel and the setup and upkeep of the hospitality rooms. Volunteers with familiarity of downtown Winston-Salem and venues around the tournament site are perfect for this department. If you love being in the know, you won't want to miss your opportunity to serve in the media room. The tournament is home for a week to some of the finest from local, state, national and international members of the press. We love our members of the media, and we need your help in greeting them, distributing results, scheduling changes and other tournament-related communications. You must be at least a rising high school senior. Any public or media relations experience is a plus. If you’re a “behind-the-scenes” kind of person who likes to get things organized for others to enjoy, then the Winston-Salem Open needs your support in our operations department. You will help the tournament staff and operator set each day’s activities and special events in motion, on court and off! This volunteer position requires a minimum age of 18 and the ability to lift up to 75 pounds. Are you the life of the party with whom everyone enjoys chatting? We need you in McCreary Tower to assist the Tournament Manager for our special events and special guests. You’ll assist with event setup, guest check-in, and greeting. Volunteers in this department will get a glimpse of just how many community-related activities the Winston-Salem Open is a part of, and you might see an extra player or two quite up close! You must be at least 18 years old and have professional verbal communication skills to be considered. If you enjoy watching a tennis match from start to finish and catching the speed of the ball then radar gun is the position for you. In this position you will work with our contracted stadium run of show technicians who will train and guide you through the role of the radar gun volunteer. This role allows you to sit in the shade, watch tennis and show fans and players the speed of the ball. If nothing gets past you, then we need you at our two main gates, accepting tickets from guests while also being able to answer questions about the tournament and the venue. It is impossible to understate the importance of this volunteer position. The Winston-Salem Open requires professional, alert people who can think on their feet and take direction well. You will be working in conjunction with our security company to ensure the safety and enjoyment of all Winston-Salem Open patrons. You must be at least 20 years old and be able to withstand various weather conditions that occur throughout the week. The Winston-Salem Open had drivers before Uber and Lyft! Drivers will be responsible for providing transportation from airports, hotels, and the tournament site as needed. You must remain professional at all times (so no Carpool Karaoke, tempting though it may be!). Volunteers in this area must be at least 25 years old and have a stellar driving record. The Winston-Salem Open will conduct a background check. You should have a good working knowledge of the Piedmont Triad and various routes local airports and venues. Do you want to see tennis action throughout the Winston-Salem Open? Our ushers rotate between the main stadium and outside courts checking tickets, directing patrons to seats, and ensuring fans maintain proper tennis etiquette. You are also a key defender against any security threats or disruptions, so you must be mature, alert, and able to communicate effectively with our security company. Ushers must be at least 20 years old and able to stand for long periods of time if-needed. Volunteers need volunteers too! If you have a love of serving others, then we need you here! You will assist with the distribution of uniforms, credentials and meals. You will be the key liaison between tournament staff and all our volunteers, assisting with questions and scheduling. Your primary station will be in the Volunteer Lounge to ensure volunteers are covering their assigned posts. For more information or questions, please contact Kinsey Schultz.